Tinkutudu got up very early in the morning. The sun was yet to rise. It was still dark. 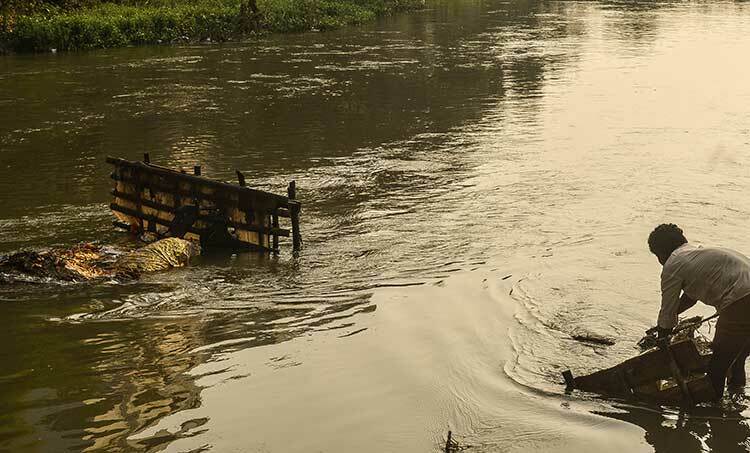 Upon seeing his wife and two children in deep sleep, he set out with his bicycle to the nearest canal where he saw many Ganesh idols being immersed the previous night.Tinku is a santhali from Mayurbhanj who had migrated to the city of Bhubaneswar in search of livelihood around five years ago. Although, he could not immediately find a suitable opportunity for him to earn, he decided to work as a daily labor along with a carpenter whom his friend had introduced to in the new city. Within a year and half, Tinku was able to master the skillful and artistic work of carpenters. When he came to the city, he was newly married. Earning 150 Rs to 200 a day would be little bit on the comfort side as compared to now when he has two children who are two and four years old. “It is very difficult for me these days. Managing family of four along with newly born children in Rs 200 a day” says Tudu while parking his bicycle beside the canal bridge to walk down the steep slope beside to get into the waters. The Raghunathpur canal in the city of Bhubaneswar, as it is popularly called was a storage canal which was dug for storing water during rainy seasons. It is situated between the highly overrated Patia (a posh real-estate area) and the Nandankannan Zoo. Earlier the communities who lived nearby, primarily farmers used it as place to take bath and finish their morning duties. They also diverted the water for agricultural purposes when required. On festive occasions the community gathered to catch fish from this canal. “These days we don’t see anyone coming here to take bath. The water has become so dirty and tidy with so many high raised building which has come nearby. The residents of the flats directly throw their waste into this canal” says Sanju who came there to finish of his morning routine. Tinku has been collecting plywood and bamboo sticks that go into the making of the Ganesha idol since the last three years. Every year, just after the day of Ganesh Visarjan, he sets out with his long knife to the pull out the wood from the idols. When asked what he would do with these woods that he has collected, Tinku replied “These idols lay abandoned here. There is no life in them. The wood and the ply inside can be used to cook food. It is wet now. But, once it is put in the sun we can use it to cook our food”. In despair he added “It is very difficult to fetch woods in cities. It is very costly here. When I was in Mayurbhanj, getting wood wasn’t much of a problem although we were restricted and harassed manier times by forest officials from our own lands” rapping up his lungi to get down into the waters. The idols of Lord Ganesha’s were glittering in all colors. The idols were immersed in water with some facing onto the sky and others upside down. 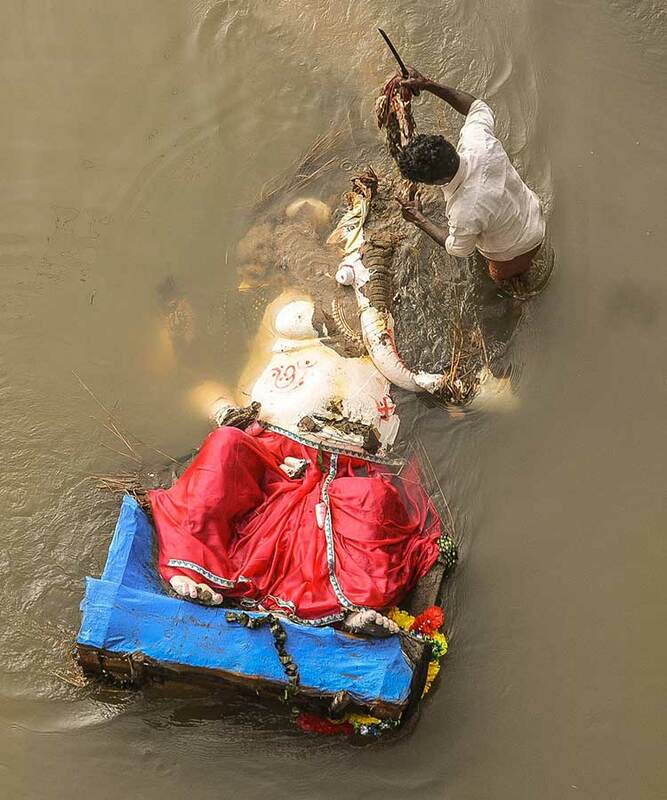 Most of the idols were covered with either red or yellow clothes which were slowly getting washed away in the waters. The water around the idol were colorful and oily. It was the sign of heavy plaster of paris (POP) and the chemical paint that has been used to make these idols look beautiful and glittery. When we got down near the waters, we saw four large size and many smaller Ganesha idols floating in the waters which had undergone the visrajan process. The previous day,Tinku says “I saw, the idols being thrown away into the waters from the top of the bridge. But, throwing away and immersion are not the same act” and bursts in laughter. He walked steadily to the center of the canal where waters were knee high and caught hold of a large Ganesh idol and dragged it towards him so that he could begin dismantling, the Ganesh idol in order to take out the woods inside. He took out his knife, which he had inserted into the towel while he tied it in his fore head. He cut open the throat and pulled out the large elephant trunk of Lord Ganesha. He carefully, took out the heavy jewels that curled around his neck made of covering silver cloths. He removed the mud and the straws that were stuffed inside Ganesha’s head to catch hold off the large Bamboo stick which was tied along to the idol at the backside so that the idol could sit upright. As he began dismantling the idol, the waters, around weren’t covered with blood, but with flowers that were put on top of the huge idol. Eventually, Tinku, cut open the shoulders and chest to remove the small ply woods that were attached within idol. Finally, he ripped off Ganesha’s leg with his large knife in order to take the large planks of wood on topwhich the idol was placed so that it could appear as if Lord Ganesha was sitting comfortably. Tinku, tied all the woods he had collected to his bicycle and said “I felt like a doctor performing an operation today. Am I not a doctor too? bursting in laughter, we bid good bye to each other. (The author is social science mimic and is currently with Kalinga Institute of Social Sciences (KISS), Bhubaneswar, Odisha).